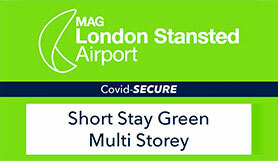 New for 2019, Short Stay Green Multi-Storey at Stansted airport offers affordable parking within walking distance of the terminal, meaning there is no need for a bus transfer. Simply park up, keep your own keys, and walk to the terminal. All car parking spaces are covered, and secure in a Park Mark standard car park. When booking this car park you must park in the Short Stay Green Multi-Storey car park only. Leave the M11 at J8a. Follow the road for just over 1 mile and follow the Stansted Airport signs. Branch left, then at the Bassingbourn roundabout take the 2nd exit onto Thremhall Avenue. At Coopers End Roundabout take the third exit, following signs to the Short Stay Car Parks. Leave the M11 at Junction 8. Take the A120 exit to Stansted Airport. At Priory Wood Roundabout take the 3rd exit, merge onto the A120 and branch left.